If the nerve within your tooth becomes infected, a successful root canal treatment can keep you from losing the tooth, while treating the infection before it causes health complications. When properly performed, a root canal is no more uncomfortable than having a cavity filled, though the procedure is more complex. 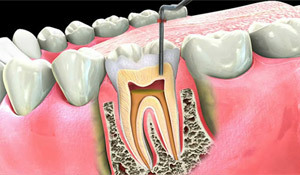 It is the removal of infected or dead pulp (the inner nerves and blood vessels) from inside the tooth, and the filling and sealing of the resulting space.